Every aircraft is tested according to Federal Aviation Administration (FAA) regulations prior to certification. The aircraft is tested by a pilot with average piloting skills in 90° crosswinds with a velocity up to 0.2 VS0 or two-tenths of the aircraft’s stalling speed with power off, gear down, and flaps down. This means that if the stalling speed of the aircraft is 45 knots, it must be capable of landing in a 9-knot, 90° crosswind. The maximum demonstrated crosswind component is published in the AFM/POH. 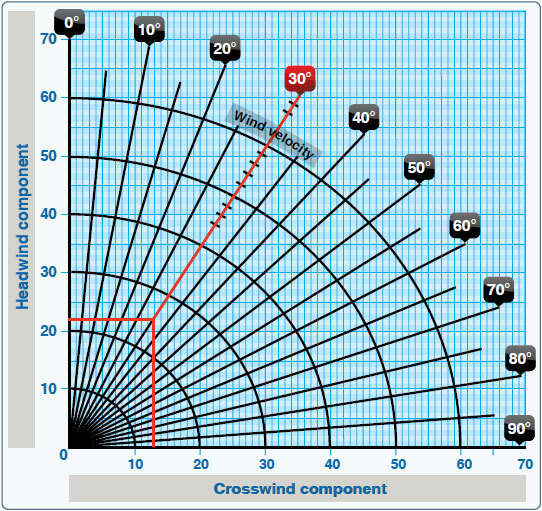 The crosswind and headwind component chart allows for figuring the headwind and crosswind component for any given wind direction and velocity. Refer to Figure 11-31 to solve this problem. First, determine how many degrees difference there is between the runway and the wind direction. It is known that runway 17 means a direction of 170°; from that subtract the wind direction of 140°. This gives a 30° angular difference or wind angle. Next, locate the 30° mark and draw a line from there until it intersects the correct wind velocity of 25 knots. From there, draw a line straight down and a line straight across. The headwind component is 22 knots and the crosswind component is 13 knots. This information is important when taking off and landing so that, first of all, the appropriate runway can be picked if more than one exists at a particular airport, but also so that the aircraft is not pushed beyond its tested limits. Figure 11-31. Crosswind component chart. Landing performance is affected by variables similar to those affecting takeoff performance. It is necessary to compensate for differences in density altitude, weight of the airplane, and headwinds. Like takeoff performance charts, landing distance information is available as normal landing information, as well as landing distance over a 50 foot obstacle. As usual, read the associated conditions and notes in order to ascertain the basis of the chart information. Remember, when calculating landing distance that the landing weight is not the same as the takeoff weight. The weight must be recalculated to compensate for the fuel that was used during the flight. Refer to Figure 11-32. This example makes use of a landing distance table. Notice that the altitude of 1,250 feet is not on this table. It is, therefore, necessary to interpolate to find the correct landing distance. The pressure altitude of 1,250 is halfway between sea level and 2,500 feet. First, find the column for sea level and the column for 2,500 feet. Take the total distance of 1,075 for sea level and the total distance of 1,135 for 2,500 and add them together. Divide the total by two to obtain the distance for 1,250 feet. The distance is 1,105 feet total landing distance to clear a 50 foot obstacle. Repeat this process to obtain the ground roll distance for the pressure altitude. The ground roll should be 457.5 feet. Using the given conditions and Figure 11-33, determine the landing distance for the aircraft. This graph is an example of a combined landing distance graph and allows compensation for temperature, weight, headwinds, tailwinds, and varying obstacle height. Begin by finding the correct OAT on the scale on the left side of the chart. Move up in a straight line to the correct pressure altitude of 4,000 feet. From this intersection, move straight across to the first dark reference line. Follow the lines in the same diagonal fashion until the correct landing weight is reached. At 2,400 pounds, continue in a straight line across to the second dark reference line. Once again, draw a line in a diagonal manner to the correct wind component and then straight across to the third dark reference line. From this point, draw a line in two separate directions: one straight across to figure the ground roll and one in a diagonal manner to the correct obstacle height. This should be 975 feet for the total ground roll and 1,500 feet for the total distance over a 50 foot obstacle. Stall speed performance charts are designed to give an understanding of the speed at which the aircraft stalls in a given configuration. This type of chart typically takes into account the angle of bank, the position of the gear and flaps, and the throttle position. Use Figure 11-34 and the accompanying conditions to find the speed at which the airplane stalls. Figure 11-34. Stall speed table. First, locate the correct flap and gear configuration. The bottom half of the chart should be used since the gear and flaps are down. Next, choose the row corresponding to a power-off situation. Now, find the correct angle of bank column, which is 45°. The stall speed is 78 mph, and the stall speed in knots would be 68 knots. Performance charts provide valuable information to the pilot. By using these charts, a pilot can predict the performance of the aircraft under most flying conditions, providing a better plan for every flight. The Code of Federal Regulations (CFR) requires that a pilot be familiar with all information available prior to any flight. Pilots should use the information to their advantage as it can only contribute to safety in flight.